The Australian Golf Media Association (AGMA) last night announced the winners of the 2015-2016 Australian Golf Media Awards, honouring excellence in golf media. Inside Golf Group Editor Richard Fellner took top honours in the “Best Opinion” category, receiving the illustrious award for work in his Page 5 Starters Box column. Fellner’s editorial, Suited to a tee: going beyond the Red White and Blue , was praised by the judges for its progressive insight into helping golfers and golf clubs adopt a “colour blind” attitude to help foster greater enjoyment of golf. This is Fellner’s third Australian Golf Media award, following his 2011-2012 “Best Column” award, and his 2006-2007 award for “Best Photojournalism”. The award ceremony was held at the AGMA annual dinner at Sydney’s Bonnie Doon Golf Club during the Emirates Australian Open. AGMA 2016 Honouree Peter Senior presented the awards in front of dignitaries from the International and local golf scene including Mr John Hopkins OAM the Chair of Golf Australia and Mr Keith Macintosh the Captain of the R&A. 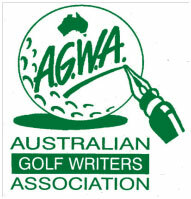 The Australian Golf Media Awards were created for media professionals who cover Australian golf and golfers in the print, internet, radio, television and photography sections of the Australian Media. The judging panel is led by former Melbourne Herald editor Bruce Baskett and representatives from Golf Australia, the PGA of Australia and the Australian Ladies Professional Golf Inc.